Shawyer made an explanation years ago about how the thruster would develop less and less thrust the faster it was going, but the mechanism made no sense, and it still proposed to violate conservation, and the whole notion of velocity changing thrust is again, a violation of relativity. Velocity relative to what exactly? Made no sense and that was just before they cut his funding in Great Britain, IIRC. He was referring to doppler shifting which moves the center frequency outside the narrow resonant bandwidth of the cavity, lowering Q, lowering thrust. I've seen 3 of his "compensated cavity" designs which address this in different ways. The first by means of changing the size of the cavity physically with gears/motors (like coarse tuning a radar), second by piezoelectrics, and more recently an accelerometer feedback to a signal generator. Disclaimer: I'm not support Shawyer, just reporting what he is saying. I don't see doppler being an issue inside the cavity wrt the reference frame of the cavity. Shawyer does operate as though the cavity and the magnetron feeding the cavity are different reference frames. "However, this ignores Einstein’s Special Law of Relativity in which separate frames of reference have to be applied at velocities approaching the speed of light. "~Where did Einstein say this? Is his statement a twist on this? : The invariance of C in all reference frames. It is as if he is confusing the fact that C is independent of any reference frame=true, with C is an inertial reference frame=false. He also says that the electromagnetic waves and the waveguide assembly form an open system. This is dubious and puts a dubious twist on the fact that the laws of physics remain the same in any inertial reference frame, given the invariance of C in all reference frames. 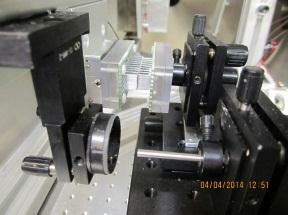 BTAIM, the cavity and waveguide are closed, so he cannot utilize this to derive linear thrust movement of the device. The Sagnac effect, from which RLGNs operate can't be used as justification for his theory, as the Sagnac effect deals with angular momentum. So using the Sagnac effect is a non-sequitur. The cavity and the amplifier feeding it and any vehicle it rides on, all share the same frame of reference. I'm trying to scrap the data from the graphs of anomalous thrust... into a clean data format for the sheer enjoyment of all. Problem with the vertical scale : page 15 fig. 19 we see that the calibration pulses of purported 30µN (29.1 precisely) span very close to 1 µm deviation on the vertical scale. Page 16 fig. upper left picture is more like 1.6 or 1.7 µm for the same purported 30µN, lower 2 pictures almost exactly 2 µm (always for 30µm or so). Page 17 fig.21 between 1.8 and 1.9 µN (to the naked eye). Page 18 fig. 22 no explicit vertical scale in µm. How comes ? Am I to trust the cal. pulses amplitudes as an (approximate) way to scale µm to µN, therefore discarding the vertical left axis scale µm readings as irrelevant display feature (but those values otherwise look perfectly sensible as to the rest position) ? Is it possible that "variations" in stiffness of flexure bearings could change that much the µN/µm ratio ?? Could it be that the calibration pulses are, well, not that much calibrated ? Any indication in the reported that I missed that could explain this huge disparity ? What should be the torque/angle spring constant of the flexure bearings ? Or the calibration gizmo where moved along the beam's axis and that changed the torque at constant force ? I need to have an independent estimate of the copper thickness in these devices. could anyone please provide a guesstimate or a range for what the thickness of the copper in these EM drives maybe ? I am also interested in the thickness of the NASA test article. Shawyer and the Chinese I don't care about because of my lack of confidence in their reporting. It is important to my evanescent wave coupling hypothesis; in the quest for yet another plausible artifact to explain away reports of thrust from an empty copper can under high power. I've been getting indications and warnings of 1/8" thickness, but I cannot confirm with high confidence. This is more "stuff" done in a non-classical way. Brito, Marini and Galian, with a smaller budget in deep South America, used a classical Cavendish-Coulomb setup and they measured the angle of rotation, which is the natural intrinsic variable that governs the torsional motion (more on this later concerning my analysis and why it is unclean and non-elegant to use displacements as degrees of freedom instead of rotations). See attached setup to measure rotation by Brito, Marini and Galian in their tests where they successfully nullified the claims of the "Mach Lorentz Thruster". Displacement of the pendulum arm is measured via a Linear Displacement Sensor (LDS). The primary LDS components consist of a combined laser and optical sensor on the fixed structure and a mirror on the pendulum arm. The LDS laser emits a beam which is reflected by the mirror and subsequently detected by the optical sensor. The LDS software calculates the displacement (down to the sub-micrometer level) based upon the beam reflection time. Prior to a test run data take, the LDS is positioned to a known displacement datum (usually 500 micrometers) via mechanical adjustments to its mounting platform. Gross adjustments are performed via set screws. Fine adjustments are performed using manually-operated calibrated screw mechanisms and a remotely controlled motorized mechanism that can be operated with the chamber door closed and the chamber at vacuum. The remote adjustment capability is necessary since the LDS datum will change whenever a change to the test facility environment affects the roll-out table or the chamber – e.g., whenever the chamber door is closed or latched and whenever the chamber is evacuated. Once the LDS displacement is adjusted in the final test environment, further adjustment between test run data takes is usually not required. Immediately prior to a test run data take, the displacement/force relationship is verified by inducing a known force onto the pendulum arm and measuring the displacement. This is done via the electrostatic fins calibration mechanism. This mechanism uses two sets of aluminum fins, one set on the fixed structure and one set on the pendulum arm. The fins overlap without touching. A calibration voltage is applied to the fixed structure fins, which induces a force upon the pendulum arm fins and an associated displacement that is measured by the LDS. The electrostatic fins design provides a constant force over a reasonably large range (between 30-70% overlap), so adjustments to the calibration mechanism between test run data takes and even between test article reconfiguration are usually not required. 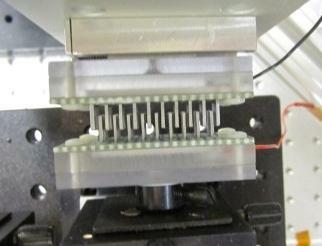 Calibration of the overlap/force relationship was accomplished using a Scientech SA 210 precision weighing balance (resolution to one micronewton). In regards to force calibration we used a set of NIST traceable, pre-calibrated meshed electrostatic fins that provided a constant attractive force between the fin pair for a given applied calibration voltage over a 25% to 75% meshed fins range. This feature allows us to generate the same calibration force independent of the loading of the torque pendulum's C-flex torsional bearings or how much the fin set is meshed within the noted fin mesh range. So is their "calibration" changing in each test? (is that why they have to verify "the displacement/force relationship ") Why does it change? What makes it change? In which direction are they measuring the displacement? Is this direction changing during the test or from test to test? Why? I expect the cavities were made of some commonly available copper sheet. I doubt that Eagleworks did anything more difficult than go to the hardware store and buy a sheet of copper. Here is a web site that sells copper sheet. Look at the choices and take your pick. Or find your own favorite copper sheet retailer. Or call your local hardware store and ask them what thicknesses they have in stock. But from looking at the photo I can't tell, the resolution isn't good enough. provided a lot of critical analysis, and possibly some insight, but not many solutions. One of my pet peeves are people who point out problems but don't provide solutions; so here's my solution. We must find a means in which a thrust vector can be attained which doesn't violate local and global conservation laws. This essentially means that we must thrust against a medium which will provide an equal and opposite reaction, but still exists inside and outside of the copper cavity. This medium must obviously be weekly interacting under normal experience, but will be available for work, when properly engineered (or fumbled upon). At least explained..... The QV, fits the bill. The QV is such a vague term. But one must remember that the QV is simply the ground state of all known fields and interactions. Now one must first ask themselves, what are all the known fields and interactions? Now of those known fields and interactions, which one(s) of those vacuum fields can provide an inertial frame of reference in which Newton's first law of motion applies? I can immediately drop fields composed of massless particles, so no photons or gluons. Massless particles, like photons are invariant. One can argue that the speed of light is slower or faster than C in a medium vs a vacuum and be correct, but they are confusing terms, as the phase and group velocity of light may vary in a medium, but the fundamental speed of light remains the same. The apparent slowing of the front velocity of light is only caused by the absorption and emission of photons by the atoms of the medium. I really feel that a dielectric medium is the means to provide a thrust vector to the vacuum. I believe that vacuum fields composed of particles with rest mass (invariant mass) are the ticket. So we have the electron field to play with right off the top of my head. Electrons have a rest mass of .511 Mev. Yes sir! My leads were from commonly available stock too. And smart fellers on this forum. aero, although you wrote "Here is a web site that sells copper sheet" I do not see any web site information in your message. Could you please indicate what website you have in mind? Sorry for asking, but -as the discussion is getting very technical- could someone of you make a quick update for the non-physicists among us (like myself)? is there any tangible progress, or has the device been demistified once for all? Francesco, we are getting close to showing, analytically, that the EM Drives test results are likely an experimental artifact. Well, I lost the site I was looking at earlier. Here's one that includes a thickness guide for choosing copper for a project. That might help but you'll have to convert the thickness to metric. First attempt to scrap the data and infer some parameter of the balance. From the top picture of figure 19 only, median natural period of oscillation would be 4.8s. A proper spectrum analysis would be more elegant but since I don't have those tools at hand I went through crest detection. See attached picture. Crests where filtered as per there relative magnitude, kept if minimum amplitude between two subsequent crests were above 5µN, working on a curve passed through a (lousy first order) band pass filter roughly centred on the target freq to measure (bottom curve) and manually discarding the periods across a known step excitation (since those would fall at random phase relative to ongoing previous remaining oscillations). There is a lot of variance, also I don't know if all those crests are relevant, the Brady et al paper say there is coupling with oceanic waves or such at a third or fourth a Hertz, that might explain the shorter periods somehow and the permanent background of excitation I was wondering about, this is in the same 3s to 4s period ballpark as the low Q main resonance mode of the balance. Something is happening after the second calibration pulse (a significant dip), someone slamming a door in the lab or a loose cable hanging around ? Anyhow, with this high dispersion I think it's better to take the median and the median is 4.8 s period. Also attached is a zip with a file (unix line endings, don't open with notepad windows, notepad++ or such instead) list of data points at .1s intervals. This is giving directly µN readings, based on the amplitude of calibration pulses at 30µN for the vertical scale. Since the baseline is drifting the absolute level is irrelevant, but it should be ok to study dynamics of the signal. This was obtained after painfully following the curve manually with a broken line (piecewise linear, latest attachment to see typical detail). The added yellow paintings and compression artifacts made it impossible to automate the process. The .1 s data points are locally averaged (running average .1s left and right at each point) from this linear piecewise reconstruction of best possible visual interpretation of pixels. Expect a lot of artifacts (quantisation from data acquisition, from data display, from camera, from compression, from piecewise linear reconstruction, from pseudo smoothing a bit around .2s ...) but those artifacts would be found for frequencies higher than 2 or 3 Hz. I didn't want to try to smooth that with too much lowpass filtering, not to erode the steps responses. Oh yes, also the perspective is put back flat (middle graph) with bilinear interpolation from the original (top graph). There would be still a small vertical magnitude factor not corrected (more amplitude on top of graph than on bottom) but should be pretty small. The slopes are much better. Will proceed with other curves, and try to pin down the damping factor (assuming simple underdamped harmonic oscillator). I have the tools at hand to do a spectrum analysis but we don't have the data in digital form to use as an input. I guess that I could do an image analysis by computer to extract the digital data, but at the moment I rather use this time to analytically explain the impulse part of the data. The natural oscillation period of the pendulum arm when loaded with the RF amplifier, its RF plumbing and the test article was around 4.5 seconds. I wouldn't put much stock in the ostensibly technical speculations that fill this thread. The results are certainly wrong and are in clear violations of macroscopic conservation of momentum. All explanations or "models" proposed to explain this (quantum plasma, virtual particles, etc.) are all based on incredibly bad physics. Any signal these experimenters find is almost certainly due to a terrible experimental method and questionable data analysis. As far as I can tell, along with the greater physics and engineering communities (from what I have seen), this is a fantasy device. Sorry, I looked some more. The site I lost sold 1/8 copper sheet. But copper sheet is available from film to 1 inch plate so looking for a common thickness of sheet isn't going to help us. I would guess it is 1/8-th inch sheet but I've nothing to base that on except having seen it around here and there and it looks like 1/8-th inch. Of course it could be 1/16-th inch sheet and I wouldn't know the difference. For the application it needs to be thin enough to roll into a cone and crimp right angle bends at both ends to attach the end plates. Then it also needs to be thick enough to hold its shape or pop back into shape when/if it is dented. Will 1/16 inch verses 1/8 inch make a difference in your calculations? Looking at my ruler, I'd go with the thinner sheet. One-eighth inch is 0.3175 cm and we might be able to see that on the photos. Add: In fact, the photo resolution is 0.11 cm/pixel, so 1/8 inch would be about 3 pixels which we would certainly be able to see. Is there a rule about resolution of a photo? We might even see 1/16 inch, at 1.5 pixels. And remember that D goes like the cube of the thickness, so that 1/8" has a D 8 times greater than 1/16"
I expanded the photo as big as it will go, and slowed my mouse as slow as it will go to take out my hand shake, and picked off a 5 pixel width of the big end edge. At that scale the 3.81 cm Frzl? beam end was 110 pixels but close to the same distance from the camera. Five pixels at that scale comes out to be 0.173 cm, or 1/16". But there is the question as to just what I measured because the ends of the cavity seem to be a board of some sort, and not all copper. What are you trying to do? I guess you want to see if the vibration comes from flexing of the thin copper. But at a GHz, that seems unlikely. Better to analyze than guess, though. But if the end is a copper covered board, as has been suggested, what would be the density of that? And what would be the likelihood of the copper covering vibrating independently of the board? Coming loose, so to speak. The cone looks like it was made from 20 gauge or thinner copper, possibly the same material roofers use. You sometimes see trucks with a big spool of it on the back. 1/8" Thick copper would require machine tools like a metal press to form. Even 1/16" thick copper (14 gauge is the closest) requires a lot of work to form into a cone and the tool marks would show. Also the weight would be an issue. I think it is most likely 20 to 26 gauge (.032" - .016"). Building an apparatus like the eagleworks em-drive would not be difficult. Just a few large pieces of FR4, some lightweight Copper sheets and a jig for forming it into the cone shape.